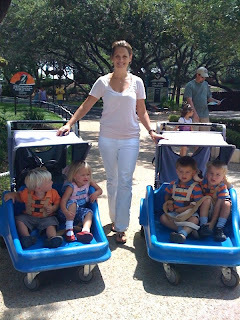 Michelle, and I took our crew of seven to the Science and Nature center for dino pit digging, then to Magnolia cafe for a pancake lunch. We got a little taste of what it is like for Jon and Kate (minus one). It actually was not too crazy. 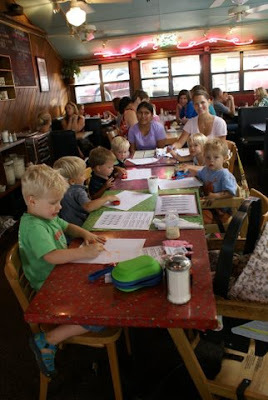 The kids were well behaved at the restaurant but I was glad to have Carmen's help. Especially when it was time to get everyone back in the car. I keep thinking that by next summer when the trips are almost four it will be so much easier. Thanks David for being an amazing father. 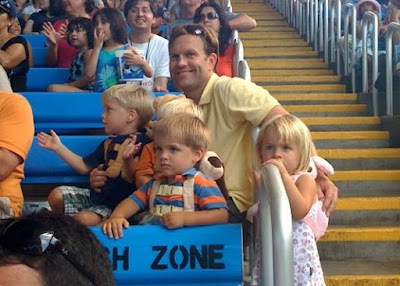 Not only do you have the skill to hold all four of your children at the same time and the willingness to watch Dora instead of Sports Center, you make sure to play and connect with each child and make them feel most loved. A few weeks ago I had a happy accident. When making my usual bran muffins I added too much water, so in a pinch I threw in some chocolate cake mix to thicken up the batter. The results were delicious and still pretty healthy. I've been adding a bit of cake mix ever since, about 1/4 a box. I guess I should take out some of the bran mix to be precise but instead I just add a bit more water and/or applesauce to get the texture I want. They are easy to make. 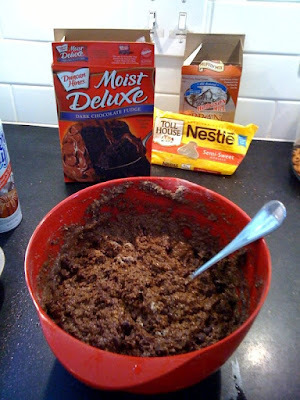 I use Hodgson Mill Bran Muffin Mix (you need two boxes for a dozen cupcakes), then add 2 eggs, 1 cup of milk and 2 tablespoons butter (or oil). I like to mix things up by adding either applesauce, raisins (dredged in flour if I have the time, if not just throw them in), chopped apples or chocolate chips. I was feeling decadent this week so went with the chocolate chips. 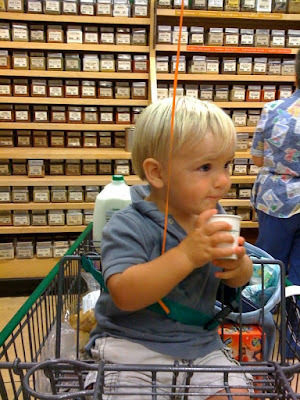 My friend Julie uses honey, vanilla soy milk (instead of milk), unsweetened applesauce and raisins which is a nice combination. What is your secret ingredient? The past week has brought lots of excitement. A sidewalk is under construction around our park. That means lots of tractors, dump trucks and cement mixers! Holden has the same passion for tractors that Will had at the same age, responding with high pitched squeals of delight when they pass by. 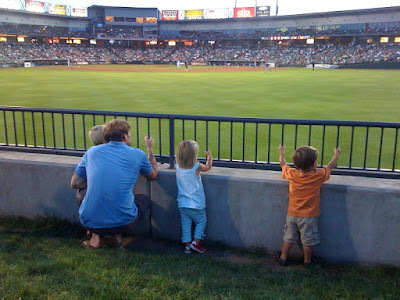 David had the great idea to take the family to a Round Rock Express game last night. 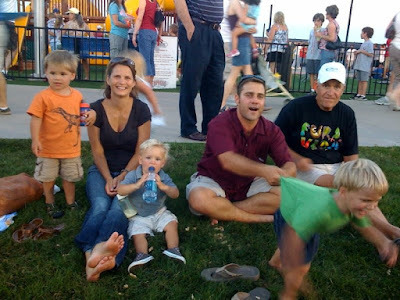 The whole local family joined us for a sweltering (high was 100) but fun filled evening. My dad, David's parents, Jason, Chris, Christy & Jack all made it to the game. The kids played on the play scape and bounce house behind the field. 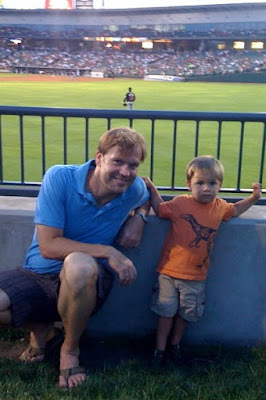 Then watched part of the game while enjoying their first ballpark peanuts that Jason showed them how to open. Holden probably enjoyed the music the most and entertained us with his clapping and dance moves. Evan (our 'E') got his very own ball cap that says 'E-Train' and wore it to bed last night. 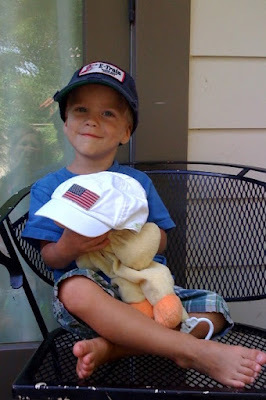 Here he is with his Pato, who he wanted to also have a hat for the photo. I'm loving this garden business. The garden itself is a bit of a messy jungle but I'm enjoying our produce. 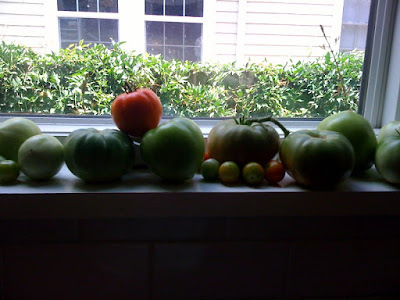 We just started harvesting our tomatoes, Carmen and I decided to pick some of the larger tomatoes and let them ripen in the window to protect them from creatures and pests. They are absolutely delicious. 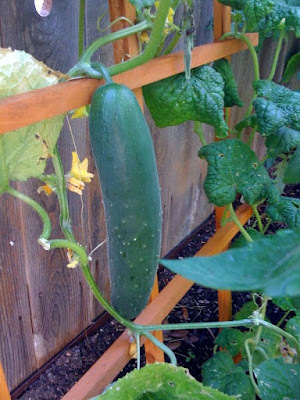 I was able to harvest only one large cucumber but it was incredibly fresh and crisp, yum. We have a couple baby cucumbers trying to make it, I hope they continue to grow. A few other beginning cukes didn't make it. For some reason my pepper plants are not taking off. I got one small banana pepper from one plant but the other two have not grown much or produced anything. The pumpkin plant grew an impressive vine but no fruit yet. This is definitely a learning process for me and for the kids. I like that they get to see first hand how their food grows. 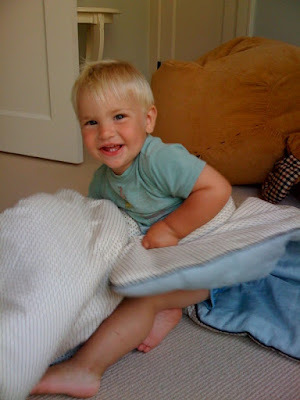 Holden had his 15 month check up today, at almost 17 months old. I waited a bit because the swine flu scare was at it's peak right when it was time to go, then he had a cold followed by hand foot and mouth virus. So now he is healthy and got a good report plus two shots. He is also getting a slew of teeth at one time, two upper molars, his four lower front tooth and two bottom side teeth all at the same time. So, while generally his regular happy go lucky self he has been a bit crabby, understandably. David and I have been running regularly for almost six months now, typically 3 miles 4 times a week and most often the same hilly trail down Shoal Creek by our house. I was just thinking how I wanted to check out some alternate routes near our house as well as check out some fun runs when I got a flier for the first Taco Shack 5k to be held on July 11th. And conveniently the course starts literally three houses down from our house at the Ramsey Park sign. And how nice they gave us the race route map which outlines a different 3.1 mile run. The next day David and I tried it out running with the kids. He completed the hilly course in about 10 minute miles (pushing 100 pounds of toddler plus the triple jogging stroller) and I completed my jog in 11 minute miles pushing one 30 pound toddler in a jogger. My goal is to do the same or better on race day. It is motivating to have some sort of goal even though my bigger goal is just to be out jogging consistently. To 'train' I have added in a few longer runs, running 4 miles yesterday and generally trying to remember to pick up my pace. I've found that when running with a jogger it is really easy to slide into a slower pace and run more up and down then forward because you have to push a bit more. Anyway, if you live here in Austin and want to join in you can sign up here. I've been putting off writing about this topic because it exhausts me even to think of it. Bedtime is a disaster. 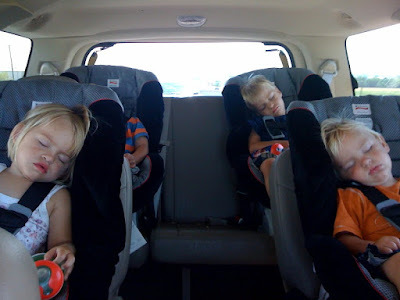 Before toddler beds it was easy breezy. Bath, book, bed, zip up the crib tents and say goodnight. Since we moved them to toddler beds in October our life has not been the same. These days we put the kids to bed around 7:30pm each night but they don't end up going to sleep until around 9pm. The kids do not want to go to bed, or stay in bed. They would rather run, play, jump, screech and giggle. Remember slumber parties? 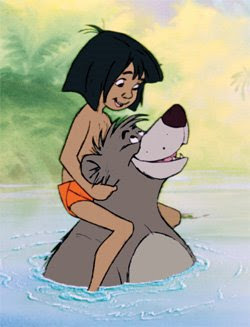 Then you get the idea. We have to repeatedly put them back in bed. It is maddening, and exhausting. Sometimes we leave the room for a bit to get our sanity back, but we can't leave them long before someones lovely is stolen which inevitably leads to someone getting injured followed by lots of crying. I finally reached out to my triplet chat groups for advice and the responses were generally commiserating, everyone seems to be facing the same issues. We were doing this in their bedroom for wind down time but their room is large and they want to run and play chase and tackle so now we are trying to do quiet play in the upstairs playroom and when we move to bedroom it is straight to bed. Less running, but still not working. We are also trying harder to avoid any TV in the afternoons and before bedtime. Although this is missed because we could get them to occasionally lie down and relax a bit. 3. Bedtime. Get into bed, sing calm bedtime songs, short back rubs and kisses. We have tried lots of things here including spending more time to get them calm, which often results in who ever is not getting attention to call out to be held. We've tried giving them water, enticing them with a special toy, and threatening them. 4. Back to bed. Spend the next hour or two putting them back in bed. This seems to be lots of fun for them. Here we try not to give them attention for negative behavior but they are pretty good at getting our attention. Some moms recommend leaving the room for 30 mins then returning to battle bedtime when they are more tired. This idea has merit but as I mentioned often their rowdy play leads to someone getting hurt. Also, I think they have figured out if someone is crying we will come back in so there is some incentive to see that this happens. Still we have to do this occasionally just so we don't go crazy. One mom suggested giving the kids a book in bed, we may try this again. When they have a toy or book it can take longer to go to sleep but they may stay in their bed longer. This works better with Lily than the boys who are more eager to run around. Lily is less likely to get out of bed but will encourage the boys to get out by calling out to them. And occasionally she joins in. A couple moms questioned our naps. During the week when Carmen is here they get solid naps, probably too late and too long. We put them down a bit earlier today. I'm not ready to give up naps and it doesn't seem to help too much on the weekends when they don't nap. And well Holden, that is another story. He sleeps great but is still sleeping with me. David converted his bed to a toddler bed last night and I pushed a twin bed up to it to transition him there. We will work on this and getting him to sleep alone for nap times as our first step. Although today didn't work out so well. Let me know if you have any other ideas for us. Early this morning David and I were debating how to spend our day. Should we go to church? Which really means that I help out with our kids Sunday School class while David goes to service. Should we go jogging to Central Market and let the kids play on the playground and feed the ducks? Lily piped up and said, "I want to go to Sea World Daddy!" We looked at each other, shrugged, and said 'OK'. Less than an hour later we were all packed up and in the car on the way to San Antonio. It was certainly a full day but David and I agreed that it was not much more challenging than keeping all four entertained and happy at home all day. The kind man at the stroller return desk even graciously escorted us out to our car so we wouldn't have to coax our four tired toddlers all the way out of the park and through the parking lot on foot. And as a bonus they got a solid nap in on the way home. Peace and quiet, well deserved. 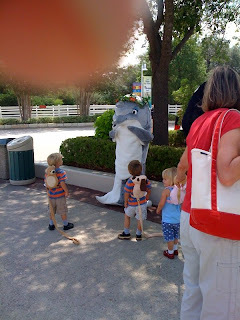 This time we checked the Sea World hours of operation before heading to San Antonio, and we were pleased to find, unlike our first trip, that the park was open. We had a wonderful day. The kids enjoyed the beluga whale and acrobat show. They must have been waiting for something about to happen in this photo because after each jump and dive they would clap wildly and memo would say 'my turn, my turn'. 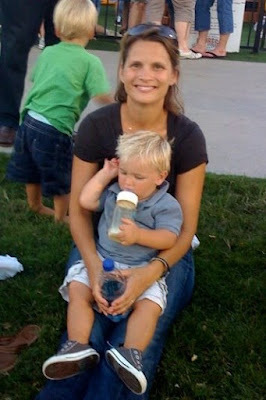 Jennifer, Clare, and Carmen are with the kids at Sea World today.